For the first time, a randomized clinical trial has shown significant tumor shrinkage with a phosphoinositide-3-kinase (PI3K) inhibitor in patients with estrogen receptor (ER)- positive, HER2-negative early breast cancer. The phase 3 study LORELEI compared neoadjuvant therapy with letrozole plus placebo versus letrozole plus taselisib, a PI3K inhibitor, in this patient population. “We were able to detect a reduction in tumor size after only 16 weeks of treatment compared with patients who received letrozole plus placebo,” said lead investigator Cristina Saura, MD, PhD, Head, Breast Cancer Unit, Vall d’Hebron University Hospital, Barcelona, Spain, who presented the results at the 2017 European Society for Medical Oncology (ESMO) Congress. “Any tumor shrinkage is positive for patients, because this means that the drug had activity against their tumor in a short period of time,” she added. 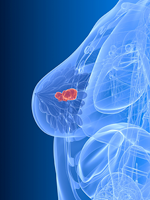 The phase 3 LORELEI study enrolled 334 postmenopausal women with ER-positive, HER2-negative early breast cancer (stages I-III) that was tested for the PI3KCA mutation. Patients receiving letrozole were randomized to taselisib 4 mg (5 days on, 2 days off) or to placebo for 16 weeks, followed by surgery. More than 60% of patients had stage T2 breast cancer, approximately 60% had grade 2 tumors, and more than 50% had invasive ductal carcinomas. The co-primary end points were objective response rate (ORR) and pathologic complete response. The study met its primary end point of ORR, which was improved in patients who received taselisib plus letrozole versus the placebo plus letrozole group (50% vs 39.3%, respectively; P = .049). The complete response rate was 4.8% in the taselisib group versus 1.8% in the letrozole group, and the partial response rate was 45.2% versus 35.5%, respectively. Taselisib achieved more robust ORR in 152 patients with the PI3KCA mutation compared with placebo (56.2% vs 38%; P = .033). “For me, the main message is that even though all the patients seemed to derive some benefit from taselisib, those with this mutation [PI3KCA] seemed to derive more benefit,” said Dr Saura. There was no significant difference between the treatment arms, including patients with PI3KCA mutation, in the pathologic complete response. Taselisib was discontinued in 10.8% of patients and dose reductions were needed in 11.4% of patients. The most common grade 3 or 4 adverse events with taselisib were gastrointestinal disorders (7.8%); infections (4.8%); skin disorders (4.8%); vascular effects (3.6%); and metabolic and nutrition disorders (3.6%). Taselisib is an oral, potent, selective PI3K inhibitor with enhanced activity against cancer cells with the PI3KCA mutation. The PI3K signaling pathway is involved in cell proliferation and is the most deregulated pathway in HR-positive breast cancer, with approximately 40% of patients showing activating mutations in this pathway, explained Dr Saura. Unlike other PI3K inhibitors under investigation, taselisib degrades PI3KCA mutation—the catalytic subunit of PI3K—by a unique mechanism that distinguishes it from other PI3K inhibitors.